Get ready to take your senses on a journey as White Rabbit Brewery and The Carlton Club team up to create a food & beverage tasting with a twist. Expect to have all your senses awakened as White Rabbit ambassador Ryan Loft takes you through some of the most-weird and wonderful rabbit folklore, whilst you sip on limited edition barrel aged sours, beers and cider which have been matched with five delicious tastes. This isn’t your everyday White Rabbit tasting event. It’s a progressive experience which taps into all of your senses. When you travel ‘Through the Rabbit Hole’ expect a journey of flavours with delicious canapés expertly matched with a couple of familiar White Rabbit beers as well as some very limited barrel aged cider and sour beers. The night is more than great food and drink, It’s a series of experiences where you’ll encounter Tezcatzontecatl the Mexican god of beer, wild wolpertinger and discover why there’s a rabbit in the moon. 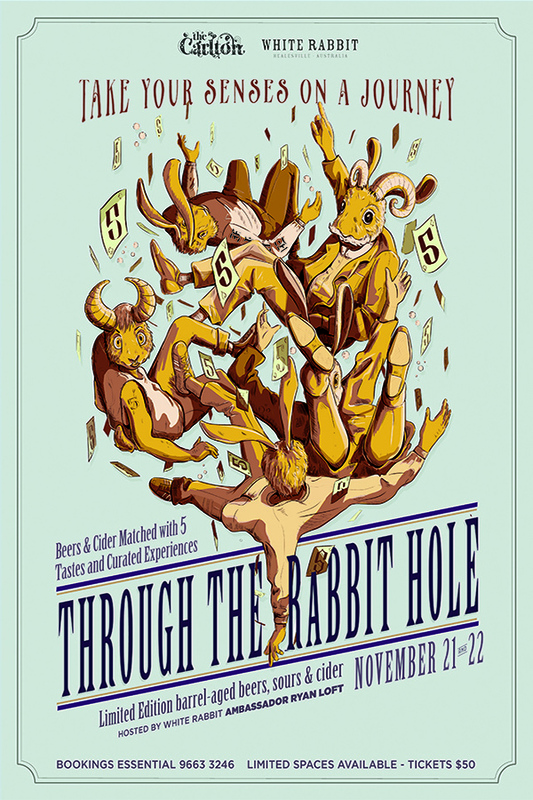 Tickets are $50 this includes five different experiences paired with five White Rabbit brews and five mouth-watering tastes.